I have been a runner for a major part of my life. Not champion material, not elite, not even great, just average. My marathon times are in the 4:10-ish area, but I do run consistently and over the decades it has become an inexorable part of my life. Problem is that running and aging don't coexist very well. Sure you see news articles about octogenarians, nonagenarians, and centenarians running marathons but that's why these folks make the news. They are a rare breed. When is the last time an average 20 year-old made the news for running an average time marathon? I am certainly not immune to the ravages of aging. There have been back issues, herniated discs, sprained ankles, joint pain, muscle tension and breathing and stamina problems. So far I have been lucky that many of the symptoms have healed or at least improved allowing me to resume running after some period of rest. The latest challenge was severe knee pain that ended up sidelining me for three months. It all started simple and small enough. A few months ago I started noticing a bit of pain in my right knee after long runs. I have had some knee pain for years arising from knee cap scraping but it has been tolerable. This pain was noticeably different but it would subside after a day and so I continued with my normal running schedule. Turns out that I should have listened to my body and reduced the level of activity because a few weeks later I was hobbling, almost unable to walk, let alone run. There was considerable pain in the lateral side (the crotch side) of the right knee and it wasn't healing. Pain medication, icing, sports gels, and knee braces weren't helping. I suddenly became sedentary and had to use a stick to walk even a short distance. Even sleeping was difficult as I couldn't fully extend and straighten my right leg without feeling excruciating knee pain. I searched for my symptoms online and talked with coworkers who might have had sports injuries themselves or had children with sports injuries. The most mentioned diagnoses were ACL injury and meniscus tear. I was able to eliminate ACL injuries or tears rather quickly. As I was explained, an ACL tear would have led to an inability to even stand up. That wasn't quite my issue. I could stand or even walk, albeit with much pain. A meniscus tear seemed like a much more likely candidate. My symptoms were very similar to those mentioned online and others with meniscus tear experience. There was pain on the side of the knee (lateral side), I couldn't straighten my leg, and the location of the pain was tender to the touch. And so as I finally visited my orthopedic doctor, I resigned myself to the fact that I had a meniscus tear, possibly requiring surgery. My doctor seemed to be in agreement but of course needed more evidence and so an MRI was ordered. 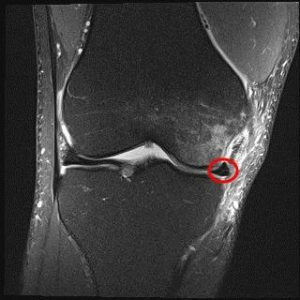 A couple of weeks later with the MRI results online, I pored over the images comparing them to online images of torn meniscus but my untrained eye couldn't determine if there was a tear or not. Here is one of the images. In other words, and as my doctor explained, this was one or more small stress fractures with some amount of fluid surrounding it. His orders were to stay off running for 3 months, take pain killers and ice as necessary. Over the next few weeks I took short walks, painful at first, and less painful as time passed. As the pain slowly subsided, I took longer walks, discarded the tree branch I was using as a walking stick. Eventually my knee became pain-free. A couple of weeks ago I finally had my first small jog, and today I had an 8-mile run, slow, gentle, but pain-free. My grandfather used to say, pain arrives in an instant and takes a long time to leave. This one didn't exactly arrive in an instant but it sure took a long time to leave, dropping me a few lessons during its unwelcome stay. Listen to your body, pain is telling you to slow down or stop. Ignore the pain and you will pay the price. It's ok to pause a habitual activity such as running while recovering. Walking isn't the same but it's a good low impact substitute. And finally, Internet searches and anecdotal accounts are interesting and educational but no substitute for a professional diagnosis.